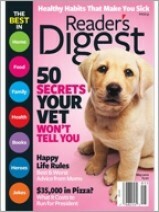 Get a Free Reader's Digest (Digital Edition). All you have to do is fill out the form on the Mercury Magazine website and get your freebie. This will be a complimentary one year subscription and not just a one time deal.